This tropical salad combines a mix of fresh greens, and veggies with pineapple and a tangy cilantro lime vinaigrette. Since I am following a vegan diet, I used Gardein chicken stripsbut normal chicken breasts would work just fine if you are a meat eater. These chicken strips are very tasty and come in several great tasting flavors. Tropical Salad with veggies and pineapple is a tasty lunch option. The dressing is made from lime juice, crushed garlic, cumin, chili powder and fresh parsley. 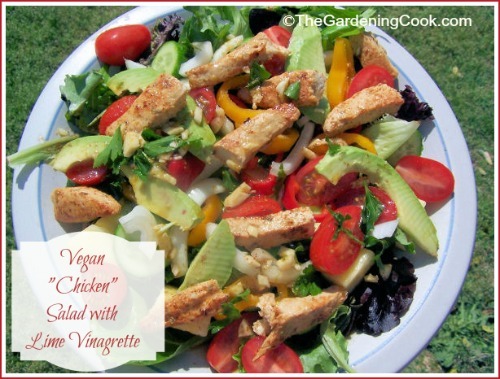 It is tangy and a bit spicy and compliments the salad well. Do you use meat substitutes in dishes? Let us know in the comments below. For more healthy cooking recipes, please visit my Pinterest Healthy Cooking Board. Enjoy the taste of the tropics with this delicious salad. Fresh veggies and pineapple combine with Gardein chicken strips and a wonderful marinade to give you a summertime sensation. Saute the Gardein chicken pieces in 1 tsp of olive oil for a few minutes on each side and then place into the marinade and refrigerate for 30 minutes. Combine all of the other salad ingredients on a plate. Use a food processor to combine the vinaigrette ingredients. Add the chicken to the top of the salad, along with the marinade and top with the vinaigrette. Enjoy!